The study also concluded that US usage in every demographic age group, gender, and ethnicity is either down or flat for Facebook. The significant part of this is that it reaffirms Facebook’s decline is wide spread and not just due to a specific segment of it’s audience. A recent study from Shareaholic concluded that website referral traffic from Facebook declined steeply in 2017. This yet is another harbinger concerning social media’s 900 pound gorilla and it’s state as an industry leader. 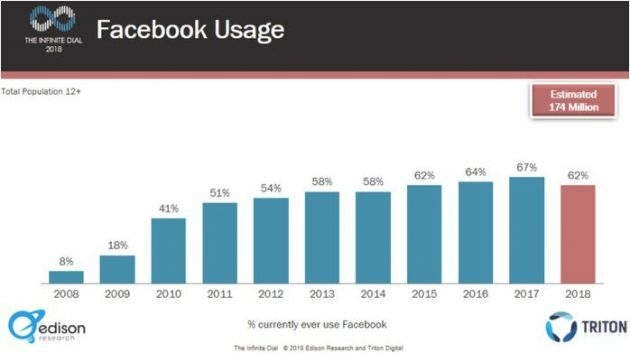 While Facebook popularity may be dipping, it’s important to note that it is still the most popular and widely used Social Network in the United States. Given Facebook’s ability to change and evolve, we’re not going to speculate on its demise. However, we are going to watch it and trends in other social media platforms closely to evaluate and anticipate where we should be placing more of our resources in the future. The research was done through telephone interview of 2,000 Americans, age 12 and above, in January and February of 2018. Interviewees were selected by Random Digit Dial (RDD) sampling for both cell phones and landlines, across demographics for ages, genders, and ethnicity. The study was conducted by Edison Research and Triton Digital as part of their Infinite Dial research series. You can read more over at Edison Research.